Channel Seven Network. 1968. Producer: Franz Conde. LP (ST) RCA Camden. CAMS 144. Music Director Rocky Thomas. Produced by Ron Wills. The assistance of ATN Channel 7, Sydney, Franz Conde, Producer of The Club Show, and Rocky Thomas, The Club Show's Musical Director, in the preparation and production of this record is gratefully acknowledged. Introduction - Nicki's Theme. (0:55). (Thomas). 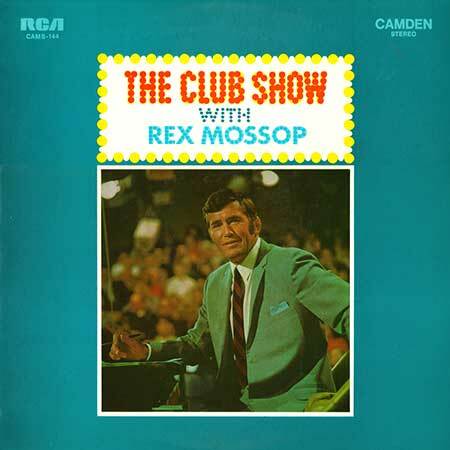 v: Rex Mossop. (Control). More. (2:42). (Newell - Oliviero - Ortolani). v: John and Marie. (Castle/BIEM). Little Green Apples. (4:02). (Russell). v: Freddy Hampton. (Albert). You've Got What It Takes. (2:43). (B. & G. Gordy - Tyran - Carlo). v: Marlene Atcheson. (Leeds). Old Man River. (3:12). (Hammerstein - Kern). v: Pete Cruzado. (Chappell). My Favourite Things. (2:23). (Rodgers - Hammerstein). v: Lorraine Smith. (Chappell). Canberra Call. v: Brian Doyle. With Rocky Thomas & The Club Show Band. Introduction. (0:12). v: Rex Mossop. On A Clear Day. (1:48). (Lerner - Lane). v: Marlene Tong. (Chappell). Sixteen Tons. (3:05). (Travis). v: Vic Soledad. (Nicholson). The Quest. (3:39). (Darion - Leight). v: Malcolm Donnelly. (Southern). Down To The Basement. (3:28). (Read - Cannon). v: The Same Day Twins. (Dratleaf). Great Balls Of Fire. (2:23). (Hammer - Blackwell). v: Warren Williams. (Aberbach). Talk About League. v: Rex Mossop, J. Raper, J. Sattler, N. Kelly. With Rocky Thomas and The Club Show Band.